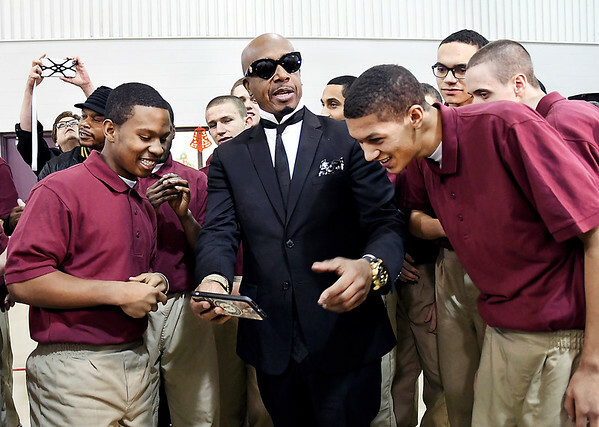 Hip hop recording artist MC Hammer is surrounded by students of The Last Mile program at the Pendleton Juvenile Correctional Facility Tuesday as he shows them a group photo of themselves he had taken on his smart phone. Hammer is a board member of The Last Mile and was at the facility for the Google.org announcement of a $2 million grant to The Last Mile to support the launch of Indiana's first coding program for incarcerated juveniles at the Pendleton Juvenile Correctional Facility. Google.org announced a $2 million grant to The Last Mile to support the launch of Indiana's first coding program for incarcerated juveniles at the Pendleton Juvenile Correctional Facility.